I’m not a libertarian, but I really appreciate the way libertarians think. I happen to not accept many of the assumptions they make about human nature and human aspirations, but the fact that they accept a set of common assumptions at all allows them to apply rigorous logic to any problem. This makes for good, smart conversation in my opinion, and they’ve got to be at least partially right. I found one such conversation on The Volokh Conspiracy last week (by way of Market Urbanism) entitled, “Do We Need More Government Planning to Create "Walkable" Living Environments?” What really intrigued me was the long stream of comments that followed this post. A clear rift seemed to develop between those who defended a low-density suburban lifestyle in its own right and those who believed the market alone should determine development patterns. How could a conversation among libertarians, all conducted under a common language, worldview, and set of assumptions, arrive at such opposite poles? 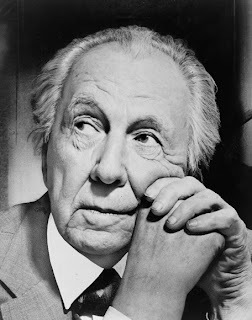 It occurred to me that maybe this was Frank Lloyd Wright versus. 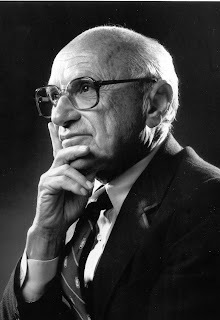 Milton Friedman, a personal liberty expressed spatially versus a personal liberty expressed through economic choices. Here is my attempt to profile the two categories these commenters fell into - not necessarily an informed evaluation of either Wright or Friedman themselves. The Wright group sees the owned single-family detached home in a quiet suburban or rural neighborhood as the libertarian ideal. Homeownership is a much preferable situation to a tenant-landlord arrangement. Individually owned private property distributes power evenly to each household, and it creates an incentive for the homeowner to maintain and enhance the value of the property. Accordingly, Homeownership ought to be encouraged by society. The Wright group has a specific conception of home. Houses without any connected walls and with generous setbacks of yards on all sides allow the inhabitants to enjoy a high level of individual autonomy. The home is the castle, the one sure segment of life entirely under personal control. Unlike denser living environments, social interactions in a single-family suburban or rural property can be maximally managed. Neighborhood relationships of any degree of intimacy do not need to be entered into involuntarily. The Wright group seems to favor strict single-use zoning measures to prevent any external intrusions into private property. Other uses mixed with residential use interfere, whether by adding traffic and noise or altering aesthetics, with the homeowner’s control of private space. Furthermore, if zoning can spatially separate socio-economic groups, it allows homeowners the freedom to purchase a home among people they choose to associate with. Neighborhood change is undesirable, because it alters the homeowner’s investment-backed expectations. The automobile is the optimal mode of transportation. Public transportation is viewed as collectivist, burdening individuals with the need to coordinate schedules and trips among a large number of people. It is not a coincidence that communist regimes have heavily invested in public transportation systems, while the free world has embraced the automobile. Walking and bicycling are fine, but access is limited to a small area. Maximum mobility in the form of efficient personal automobile travel is something that should be encouraged by society. The Friedman group believes that the spatial distribution of development ought to be determined by a free market. There are many different preferences for living arrangements in society, and these preferences change through time. The market does the best job matching the supply of housing and transportation with demand in any particular region. It is best to let the spatial arrangement of a city emerge from a multitude of individual choices, rather than to be shaped by the predetermined selection of a preferred type and tenure of housing, and mode of transportation. Their view of homeownership is more ambiguous. While there are benefits, mortgages do create inflexibility in the labor market, making it harder for regions to adapt to changing conditions. Instead of using tax incentives and other programs to encourage homeownership, the federal government should stand back and let the market determine the optimal balance between renting and owning. The Friedman group continually points out that the Wright group’s ideal living arrangement essentially requires governmental intervention at all levels. The automobile-oriented transportation the Wright group prefers is highly dependent on the federal Interstate system and road-building at the state and municipal level. Contrary to this arrangement, the Friedman group believes that if the costs of driving are fully realized by users of the infrastructure, a diversity of transportation options would naturally arise to meet a diversity of needs. At the local level, land use controls, such as the separation of uses, minimum parking requirements, and mandatory low densities through zoning, are considered to be unwanted interventions into the market. The same is also true for “smart growth” policies intended to concentrate development in particular locations. The Friedman group insist that low-density living arrangements should be an option, but that they should not be required, or even subsidized, by government. The externalities of low-density living, including costs of public services and infrastructure, ought to be incorporated into the cost of living for individual homeowners and tenants as much as possible. Doing so will allow the market to allocate scarce resources, particularly land, most efficiently. This is presumed to shift the balance of development toward cities. I guess I would label that pro-suburb camp as in favor of autonomy rather than a true laissez faire doctrine. Ironically, autonomy as an ideal could be compared to modern liberalism in philosophy. It's interesting also in terms of the classic contrast between Wright, the romanticist and Le Corbusier the modernist. The planning movement most closely related with Corbu is deplored by both libertarian urbanists and suburban autonomists. Ironically, his modular ideas would be compared with progressive or even fascist philosophy. I know that Wright was considered to be the inspiration for the protagonist in Ayn Rand's Fountainhead. His conception of Broadacre city was pretty explicit about maintaining the individualism of private lots. Beyond that, I don't know much more about his political views. Some of his architectural plans did seem to require some authoritarian control, however. Maybe calling him an orthodox "libertarian" in terms of laissez-faire economics is a bit of a stretch. Not sure. That's interesting. Now that you mention it, I remember our Professor saying something about Wright when we watched Fountainhead in Arch 100. It makes sense. Wright is the prominent figure of Romanticism in architecture, and Rand is the prominent figure of Romanticism in in libertarianism. Both are controversial figures, especially within their respective categories. Interestingly, I vaguely remember Wright being involved with some far left movements. I would be strongly in favor of the second camp as an experiment to see what the market will bear in terms of smart growth development. Unfortunately, one of the most well known examples of laissez faire planning - Houston - is hardly a role model for smart growth. That might be a result of pro-auto federal and state policies. However, from what I understand, it is a poly-centric region with dense employment centers scattered throughout. There is potential in the built environment for a sustainable city. Also a good example of free market approach is London. Autos have high registration fees, high gas taxes, tollways and congestion charges. One could argue that drivers are paying their fair share for roadway construction, maintenance, and externalities on the environment. However, transit riders also pay essentially full-cost fares (bus rides are $3-5 and the Tube costs $10-15 a ride). In light of this, London has high alternative transportation mode share. One other tid-bit: market research study in California suggest that single family homes are overbuilt and multifamily units are something like 30% underbuilt. Daniel...So far, a forerunner candidate for "most incisive blog post" of the year. Seriously. As a sideline comment: many in the Friedman group are ambivalent and even conflicted about public transport...They still favor the vehicle, so in my book there is a pink/lavender shade of quantity obsessed "Atomized Urbanism" kinda wafting implicitly in the ideological background of libertarian blog posts I've noticed...I see it esp. in proponents of toll road economies. Maybe it's Broadacres vs. Radiant City all over again. In a similar spirit, any chance you've read The Architecture of Paradise by William A. McClung (which contrasts Broadacres with Radiant City)? Bill McClung is also the author of a fascinating book on dual (and subtly contrarian) American idealisms called Landscapes of Desire, which talks about the paradoxical utopian motivations shaping and imaging LA. Hey that other Charlotte-towne up there is producing good stuff. ') Cheers! Eric, thanks man. Next time I'm near a library (wife has put a moratorium on book-buying until I build a new shelf :) ) I'll take a look at the McClung book you mention. Regarding Houston, check out this article by a guest author, Stephen Smith: Urbanism Legend: Is Houston Really Unplanned?I disagree with the author about the roll of associations and deed restrictions. Additionally, I think overspending on roads and highways has the biggest blame for Houston's land patterns. Regarding Homeowners associations, a libertarian should have no problem with any voluntary association. What a libertarian would object to is any coercion used by a government or individual to force people to do something they didn't specifically agree to. However, a libertarian would not be in favor of publicly funded and maintained roads that benefit such an association at the cost of outsiders. The association would have to take full responsibility for its infrastructure. To describe the libertarian ethic succinctly in its most radical form: all interactions among individuals should be voluntary; thus all forms of coercion are inherently violent and intolerable. This test can be used to examine any issue, even non-political ones. I plan to tackle similar issues in posts that I am currently planning. In college I was taught that the most prominent distinction between libertarianism and liberalism was the value placed on process vs. outcome. As I understand it, libertarianism is much more concerned with setting up a political framework that maximizes individual freedom than the outcomes that result from that framework. Liberalism, conversely, focuses on outcomes and permits a more active government role in the economy to achieve those ends. But the "Wright Libertarianism" really flips that schema on its head. It assigns priority of rights with the purpose of achieving a normative outcome - namely, the mandating of a Leave it to Beaver suburb. In doing so, it restricts the rights of others in ways that would make traditional libertarians very uncomfortable. Would a libertarian really say that the "right" of a wealthy person to live among other wealthy people trumps the right of a family of more modest means to live peaceably where it chooses? More generally, Wright libertarianism conceives of an expansive right for incumbent property owners to impose their preferences on prospective property owners. In my mind this gets you the worst of both worlds - bad process and bad outcomes. It is little more than selfish NIMBYism that undermines democracy. Epar, that's a great way to frame the distinction. Process vs. results. I think it makes sense of the two different camps. As far as NIMBYism (or lobbyist funding for that matter) goes, I do think raw self-interest plays an important part in the positions people take, but it seems like many people genuinely think the Leave-it-to-beaver world would be a better place to live in. Some people seem to be fighting hard for this even when there is no direct personal stake involved. Just came to this late, following a link back from my blog. This is an interesting exercise, but fundamentally I think it boils down to the fact that Wright was an architect and Friedman was an economist, and like all professionals they tended to reduce the complexity of life to the frame of their particular profession. When you express Wright's ideas in words, they sound pretty simplistic and even daft. But the drawings of Broadacre City are very powerful. Wright wrote when he needed to, but he thought in pictures. No economic argument is going to touch his ideas where they really lie, which is in the images themselves. It's like those famous Corbusier drawings of La Cité Radieuse, the big towers in parks with strangely unclogged freeways running between them. Any transport planner will tell you that's absurd, but so powerful as a drawing that it inspired architects for a half-century, and we will be cleaning up their mess for another half. As a transit planner I'm very sensitive to the hot nerve that Wright touched. Broadacre City looks like a world where people feel free and experience freedom spatially. That's why, for example, I constantly emphasise that in its own ideal context -- the dense large city -- transit can be the instrument of freedom, delivering people not just to jobs and society but also to the green spaces that great cities have, and that Broadacre City impossibly imagined that everyone could live in. True freedom or lead weight around the neck?